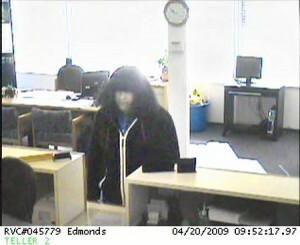 And so continues the exploits of one goofy bank robber, whose disguise — dressing as a woman — seems to fool no one. And yet authorities can’t catch him. At least, not yet. 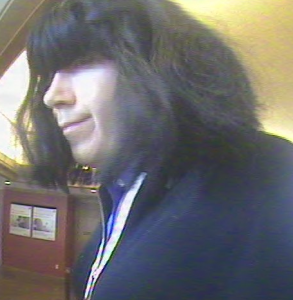 The man dubbed the “Man Hands Bandit” by the FBI, has struck banks in Poulsbo, Edmonds and North Seattle. And on Thursday, he hit a Shoreline bank. He always has a note, and seems to escape on foot (though his first robbery there was an alleged getaway driver). As Christine Clarridge, Seattle Times reporter points out, most robbers try to be obscure in their appearance so not to attract attention. A man badly dressed as a woman, however, attracts lots of attention. And still, he gets away. It appears the “Man Hands” Bank Robber knows how to take a ferry. The FBI is connecting a hold up at a bank in Edmonds Monday to one that occurred at the Kitsap Credit Union in Poulsbo last week, according to a number of news organizations. They believe both robberies were committed by a man dressed as a woman they’re calling “The Man Hands Bandit,” in honor of a Seinfeld episode. Seriously. Shortly before 10 a.m., a man walking in to the First Security Bank on Edmonds Way. Yes, he was wearing a black wig. And he passed a note to the tellers demanding cash. And yes, he was wearing a sporty black tracksuit. Perhaps the FBI should enlist the help of the Washington State Ferries, whose Edmonds-Kingston run would provide Mr. Man Hands his most convinient access to both banks. Anyone with information about him is asked to call 911.